Self Practice: a wild beast, appearing like an inconceivable task for the student used to guided classes or mysore spaces held by teachers. It can seem daunting and difficult to go through the practice on one’s own with no assistance, no adjustments, no corrections, not even the watchful gaze that keeps us on the breath, keeps us intentionally in the zone in which yoga happens. With me preparing to leave Cairo and with my friend Iman still studying in India, there is a short gap of time in which there will be no present teacher for the Ashtanga Yoga Egypt students and the choice to self-practice will arise. I can only hope that most will choose this path for the short term–it is a wonderful opportunity to connect with the guru within, to get to know yourself, to grow with your practice. I cannot stress enough the importance of having a teacher with whom you deeply resonate with and with whom you are willing to trust your body and your process. But in the times when there is no teacher, when there is no mysore space to rely on, the responsibility of practice falls into the hands where the practice of yoga belongs to the most in: your own. It’s true, a solo mat practice has its challenges but its rewards are incalculable. In my own experience, over the last 7 years, I have been blessed with instructors who passed through where I was living; they would come and they would go, but always leaving me with so much. In 2010, I then started practicing in India with Sharath Jois, who I now consider my main teacher. Since then, I have been in the presence of my teacher for three months out of the year, and then I am on my own again and self practice is often the only option. It’s ok, because there’s plenty of “homework” –lots to cultivate, to practice until the next time. This time of self study (svadyaya) can be a wonderful experience of integrating the practice into the system, into the body and the mind. These gaps have been very rich. They have allowed me to take responsibility for my own practice, they have taught me to be independent, to be inquisitive and discerning. I have learned the difficulties of self-motivation. And, yes, I have at times stumbled and lost my flow. I’ve also felt the joy of returning to practice, how my body rejoices at the breath and movement, how my mind stills and empties, how grounding it is, how expanding. More than anything, self practice establishes the relationship between you and your own practice, that whether your teacher is present or not, your practice is yours–recognizing this is so very important. Sunday is my last class in Cairo. The first Aswan retreat starts on December 19 (to the 22), the second on the 24-27 December. Spaces are still available in the second batch. 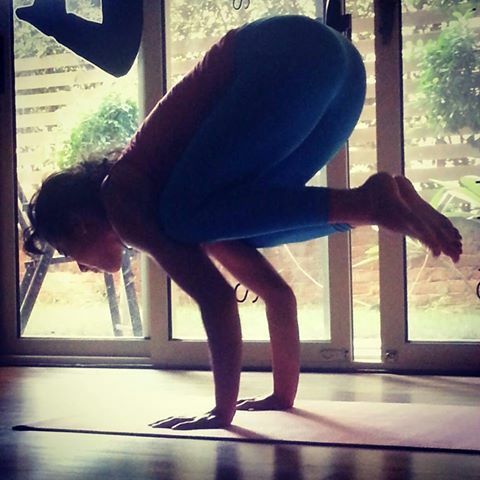 & Iman Elsherbiny will be returning to Ashtanga Yoga Egypt from a very fruitful Msyore, India season in February. Photo by Zeinab Lamloum. Bakasana during my own self-practice after teaching.